Take your students to Queenstown, a hub of natural beauty and exciting activities. Surrounded by spectacular mountain ranges, Queenstown offers students world-class skiing and indescribable beauty at every turn. Coronet Peak is rightfully the most popular ski resort on the South Island and The Remarkables are true to their name in both scenery and snowsports terrain. Off the mountain, students will journey into the spiritual world of Maori culture, in a culturally immersive experience. Welcome to New Zealand Board your private coach as you make your way to your accommodation in the ‘adventure capital of the world’. 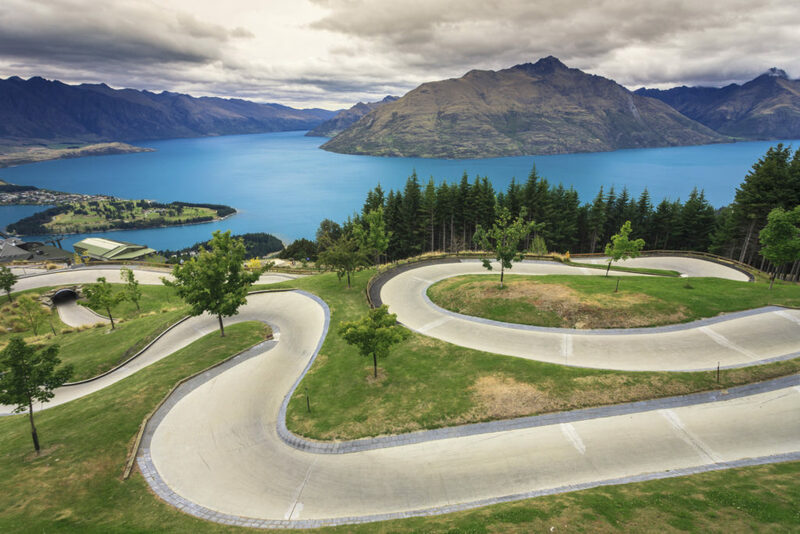 Explore Enjoy an afternoon of discovery as you explore the epic views and buzz of downtown Queenstown. Afterwards collect your snow gear before you enjoy a delicious dinner. Hit the slopes After breakfast each morning, transfer via private coach to the Coronet Peak ski fields. Optional activity Navigate challenging spaces, quirky physical obstacles, illusions, lighting effects, scents, sound effects and strange sensations at Odyssey Sensory Maze. Hit the slopes After breakfast, cruise the roller-coaster terrain of Coronet Peak in a snowsports lesson. Enjoy lunch and afternoon leisure, as you practice your newfound snow skills! Hit the slopes Build your senses in the snow during your morning lesson. Stay on the slopes of explore the city in the afternoon. On the move After breakfast jump about the special 4WD bus to take you to the starting point of your rafting adventure down the mighty Shotover River. Shotover Jet It's time to board the boat and hit the river for thrills and spills through the canyon in the Shotover Jet jet boat experience. Lunch It's back into Queenstown for the world famous Fergburger lunch. A night to remember For dinner we take to the Skyline Gondola to take you high above Queenstown up Bob's Peak, then luge all the way down. Be treated to a buffet dinner and an unmissable Maori culture and star gazing experience. Hit the slopes After breakfast, venture to the impressive peaks of The Remarkables ski area for your daily lesson. Explore the scenic terrain and develop your skills in the afternoon. Optional activity Test your confidence at the high ropes challenge course. Steamboat adventure After breakfast, we jump aboard the historic TSS Earnslaw – the southern hemispheres only operating steamboat – and take the journey across Lake Wakatipu to Walter Peak High Country Station. Walter Peak station At Walter Peak we look at how an NZ station runs – shearing sheep and meeting the dogs that keep them in line! Bounce Back in Queenstown for the afternoon and its over to SITE trampoline for more fun and adventure. Final day After a final breakfast we take a walk through downtown Queenstown and play a round of disc-golf at the Botanical Gardens. Departure We catch the coach from downtown to the airport for the flight home to Australia. Queenstown airport was recently voted the world’s most scenic – so getting a window seat is a must do! Thank you for your interest in our WorldStrides NZ South Island Culture and Snowsports Tour Tour! Please tell us a little more about yourself so we can get you sent to the right place.